Accurately restored period rooms interpret the 18th- and 19th-century history of Raynham Hall. 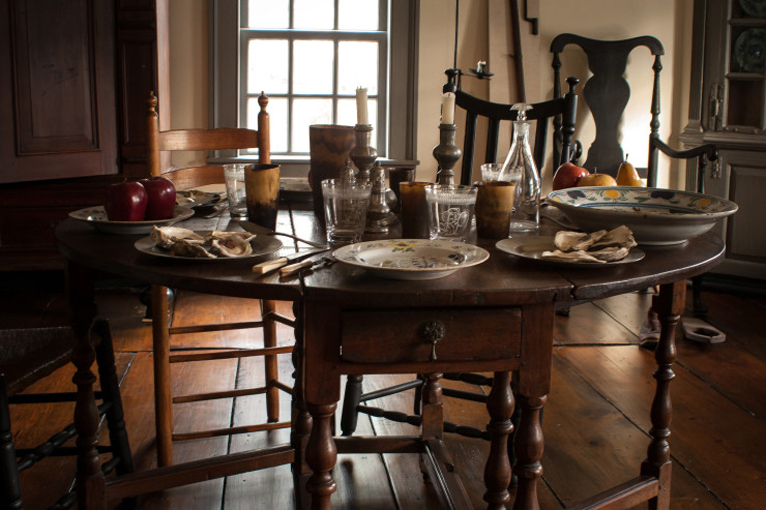 In the colonial house, the period rooms are furnished to reflect the decade of the 1770s, when the Townsend home was used as the headquarters of Lt. Colonel John Graves Simcoe. 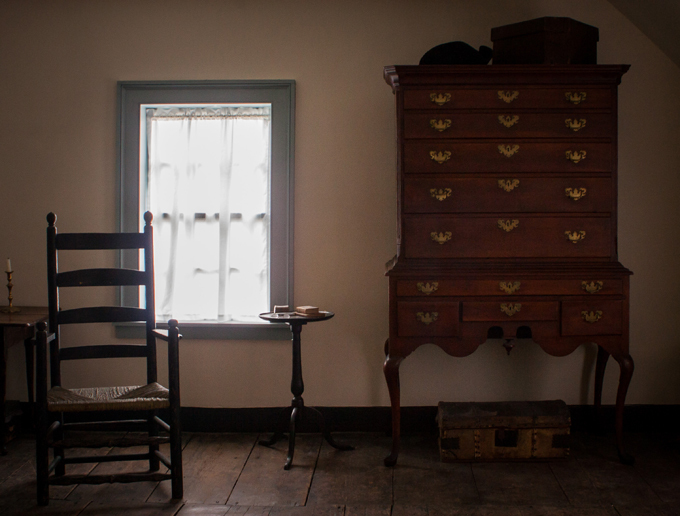 The colonial rooms are rich in original Townsend furnishings as well as examples of early Long Island furniture. 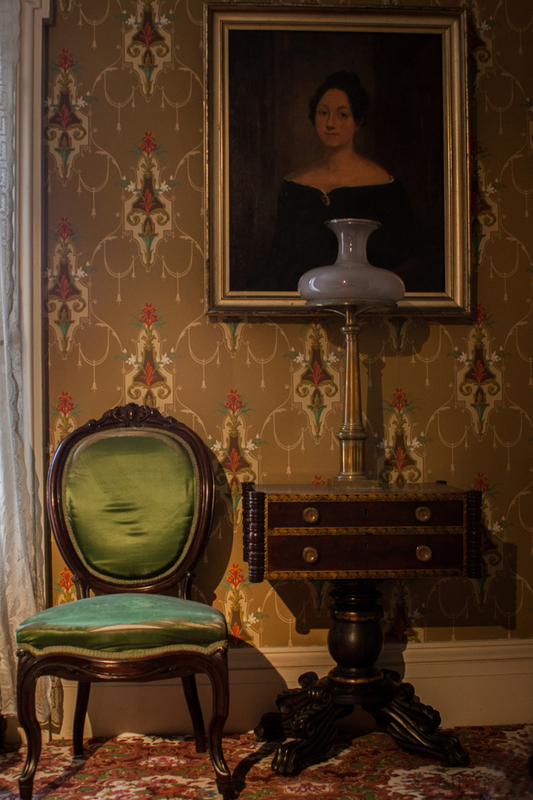 Period rooms in the Victorian house, restored to the decade of the 1870s, are arranged with examples of the elaborate and stylish furnishings that would have been found in the home of Solomon Townsend II. The richly patterned wallpapers and carpets, expensively upholstered furniture, and decorative objects arranged on mantelpieces, tables and shelves contrast with the sparse quality of the colonial rooms. 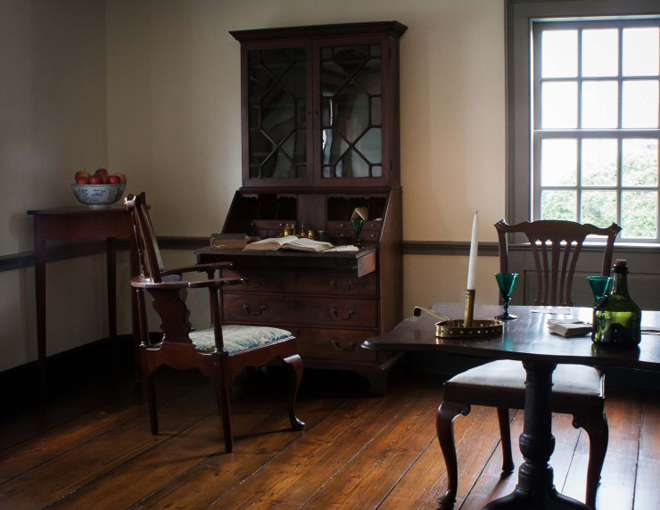 Samuel and Sarah raised eight children, and this colonial-period family room would have witnessed a variety of activities including spinning, sewing, caring for the children, reading and writing, and taking meals. Samuel also used the hall as an office and a store. In this room he met with many visitors such as sea captains, merchants and townspeople. As a purchaser and exporter of local farm surpluses and an importer and retailer of European goods and tropical produce, he most likely sold many goods from the hall. 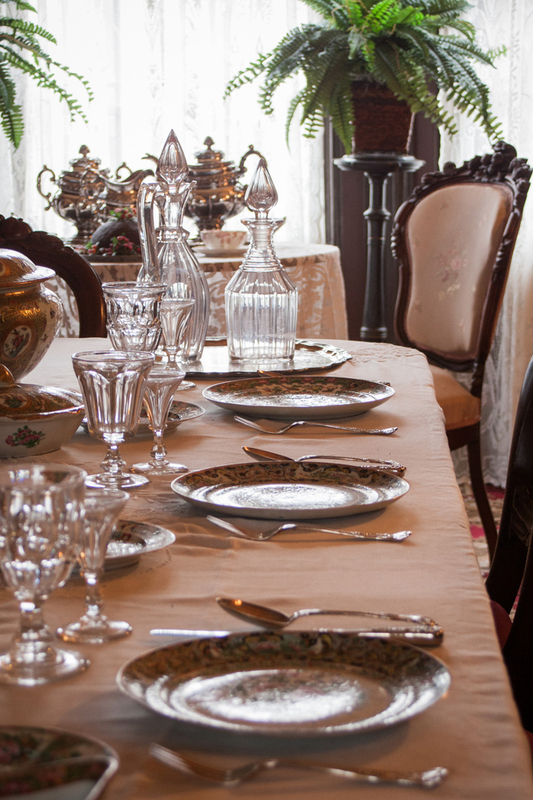 In the colonial period, the parlor was the most formal room in the house, used for receiving and entertaining guests. It served as the setting of important social activities such as tea drinking and card playing. As the “best” room, the parlor contained the Townsends’ most expensive furnishings. 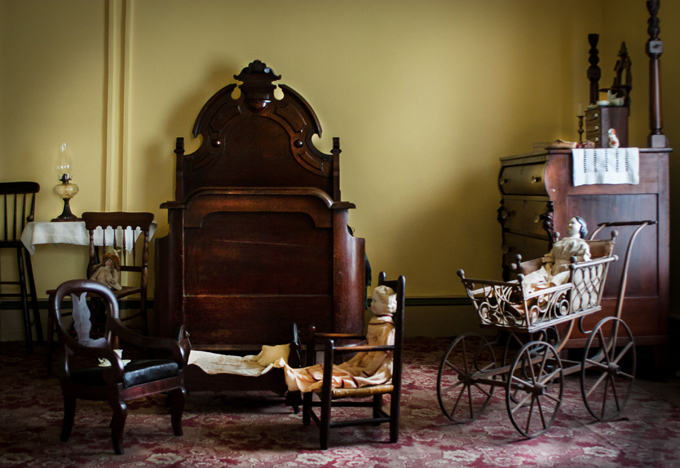 Furniture in a parlor of the colonial period was arranged along the walls when not in use and brought out into the center of the room as events required. Typical parlor furnishings are seen in the tea table, secretary, tall-case clock, drop-leaf tables and multiple chairs. When the house became British headquarters during the American Revolution, the room’s most famous guests were commander of the Queen’s Rangers, Lt. Col. John Graves Simcoe, and his officers. Samuel and Sarah Townsend occupied this bedchamber. Samuel’s importing and exporting business afforded the Townsend’s access to the type of rich printed cotton fabric used in the bed hangings. Not only were the hangings decorative, but they also provided warmth and privacy. Due to the absence of closets, pieces of furniture such as the Townsend family high chest of drawers, which was made in an Oyster Bay cabinetmaking workshop circa 1730-1750, were used for the storage of clothing and other textiles. Solomon’s children consisted of five boys and one girl. This may have been the bedroom of their only daughter, Maria. Today it is represented as a nursery, where the nursemaid cared for the small children in the family. Her daily activities included bathing, dressing and feeding the children, who slept, played and took their lessons in the nursery. Arranged throughout the room are many period games, toys and dolls. Family and friends spent evenings in this room, engaged in various leisurely pursuits such as reading, talking, needlework, listening to music and playing card games. The parlor was also used to receive visitors and to entertain guests on special occasions. The walnut parlor suite, c.1850-1860, is in the Rococo Revival style, which was at the height of fashion in the mid-19th century. The sewing table, center table and piano forte are excellent examples of Empire-style furniture, c.1825-1840. A portrait of Helene DeKay Townsend, mistress of the villa, adorns one of the walls. This impressive room was used for many formal dinner parties. The room features a unique vaulted ceiling, an element of Gothic Revival design. The bay window on the west side provided access to the garden through two doors and was no doubt arranged with plants, forming a small conservatory. Growing plants indoors was a developing interest during the nineteenth century. Arranged in the bay window is a miniature greenhouse, named a “Wardian” case after its inventor, Nathaniel Ward.